James Wilson, one of the framers of our Constitution said in 1787: “The people may change the Constitution whenever and however they please. This is a right of which no positive institution can ever deprive them." Wilson called it a “Popular Amendment” and its time has come. The “positive institution” he referenced is, of course, the United States Congress. Our political establishment has frantically tried to pass yet another "immigration reform" law granting "legal status" (amnesty) to over 12 million illegal aliens currently residing in America. They didn't, so President Obama thumbed his nose at our Constitution and lawlessly mandated "amnesty" to another five million illegal aliens on top of the two million so called "Dreamers" he amnestied two years ago. Time is running out on our ability to stop this insanity and the destructive Afforable Care Act. I invite you to read my case, but if you have kept up with President Obama's lawlessness and the Democratic Party's lock-step approval of his every action, you probaly don't need to. Twenty-six state legislatures sued President Obama to stop his lawless amnesty; he calls it "delayed action." Texas Federal Judge Andrew S. Hanen imposed a stay on Obama's executive order in February and refused to lift his stay this month when the Obma administration appealed. We the people need to show these brave state legislators that we agree with them and have their back. If you agree with my proposed amendment petition below, please print it, sign it and mail it to your state legislature. We citizens can have a dramatic impact at this critical time; if we get involved. In his arguement on behalf of the 26 states for the stay, Texas Solicitor General Scott Keller said: "This lawsuit is about the separation of powers" and "This is about a 26-state coalition upholding the rule of law." If ever there was a time for we the people to join forces with a "coalition of 26 states" and principled politicians, that time is now. If 26 state legislatures can fight back, so can we. I, Ed Ruff in Naples, Florida posted this web site on September 11, 2013 and my wife and I sent our petition to the Florida State Legislature the same day. Join us and we can speak in one loud and clear voice. Join us and we can help bring the United States back to the rule of law. entirety; and the legislatures in the several states shall decide in their sole discretion the health care insurance laws in their state. Section 2: Amnesty or legal status of any nature shall not be granted to any person illegally residing in the United States. hundred and eighty days from ratification shall be deported; and they shall be prohibited from returning to the United States. land, sea and air; and Congress shall establish time tables for completion; and they shall closely monitor the progress. grant sanctuary to any person illegally residing in the United States. application for a job, driver’s license, social security number or government service. days before voting day and shall be suspended on the Sunday and Monday immediately preceding voting day. time of their birth shall be permitted to sponsor any person into the United States. proceedings of the Government of the United States and the governments of the several States. Section 10: The Congress shall have power to enforce this article by appropriate legislation. Section 1: The Patient Protection and Affordable Care Act enacted by Congress on March 23, 2010 shall be rescinded in its entirety; and the legislatures in the several states shall decide in their sole discretion the health care insurance laws in their state. Section 3: Any person illegally residing in the United States shall have one hundred and eighty days from the ratification of this article of amendment to depart the United States; and they shall be permitted to apply for reentry to the United States subject to all legal requirements pursuant to the laws of the United States; and any person illegally residing in the United States after one hundred and eighty days from ratification shall be deported; and they shall be prohibited from returning to the United States. Section 4: The Congress of the United States shall pass legislation specifically requiring the President to employ every resource available to the federal government to secure all of the borders of the United States against illegal intrusion by individuals by land, sea and air; and Congress shall establish time tables for completion; and they shall closely monitor the progress. Section 5: The Congress shall grant to the States and to every legal jurisdiction within each State the authority to enforce the laws enacted by this article of amendment; and the Immigration and Customs Enforcement Agency shall take custody of and deport any person illegally residing in the United States and apprehended by any State legal jurisdiction; and they shall cooperate with the States and compensate the States for their efforts in enforcement of this amendment; and no State legal jurisdiction shall grant sanctuary to any person illegally residing in the United States. Section 6: No person or business shall employ any person illegally residing in the United States; and all persons residing in the United States shall be required to show proof of legal residency when they are apprehended for any violation of the law and upon application for a job, driver’s license, social security number or government service. Section 7: All persons shall be required to show proof of United States citizenship when registering to vote and bona fide photo identification (ID) to vote, which shall be issued upon their registration or re-registration by the registrar of elections where they reside; and absentee ballots shall be notarized and the notary public shall require said bona fide photo ID; and all States shall purge non-citizens and deceased people from their voter registration rolls; and early voting shall not commence prior to seven days before voting day and shall be suspended on the Sunday and Monday immediately preceding voting day. Section 8: The first sentence of the fourteenth article of amendment to the Constitution of the United States is hereby amended to require that to be granted United States citizenship at birth both parents shall be United States citizens; and a child born to legal immigrants who are both subsequently naturalized shall be simultaneously naturalized; and no person born prior to the passage of this article of amendment whose parents were not United States citizens and to whom United States citizenship was granted at the time of their birth shall be permitted to sponsor any person into the United States. Section 9: The English language shall be the official language of the United States. As the official language, the English language shall be used for all public acts including every order, resolution, vote, or election, and for all records and judicial proceedings of the Government of the United States and the governments of the several States. 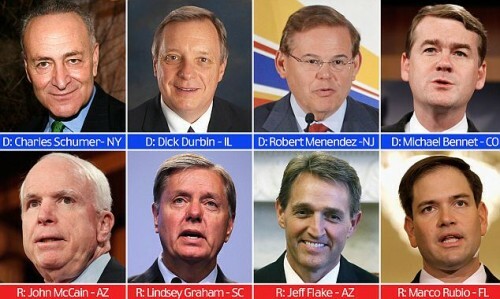 This "Gang of Eight" United States Senators, four Republicans and four Democrats, cobbled together a twelve hundred page law called: Border Security, Economic Opportunity and Immigration Modernization Act of 2013. It was voted out of the Senate Judiciary Committee on May 22 and voted out of the full Senate on June 28 by a vote of 68 to 32. How many of the 68 do you think actually read this bill? Their long fancy name can't hide the fact that it's just another amnesty bill. Sen. Rubio quit the gang on October 30; his poll numbers plummeted and he decided a catch-all bill was not the best idea. Their bill grants "legal status" to their estimate of eleven million illegal aliens currently residing in the United States. They say that securing our borders will come later. Who are they kidding? They don't even believe that. Their proposal attempts to reform illegal and legal immigration in the same bill, which only serves to confuse the issue. Legal immigration also needs fixed, but that won't happen until illegal immigration is stopped once and for all future generations. We are a nation of legal immigrants and that experience has been denigrated by illegal trespass of our borders by at least 18 million illegal aliens during the past four decades. Illegal immigration and amnesty make a mockery of legal immigration and the rule of law! The House of Representatives had their own "Gang of Eight", but two have dropped out and one is not yet known. The remaining four known "gang" members are: Democratic Reps. Xavier Becerra CA, Luis Gutierrez IL and Zoe Lofgren CA; and Republican Rep. Mario Diaz-Balart FL. They are still debating their version in secret and it reportedly conflicts with the Senate version. They say that their approach will be incremental instead of one BIG bill. President Obama met with senate Democrats on January 16 and told them that he "will use executive orders to to act on immigration reform if congress stands in his way." In other words, he will grant amnesty to all illegal aliens currently in the United States. Article I, Section I of our Constitution "stands in his way" not congress. Congress has passed seven laws granting amnesty to six million illegal aliens since 1986, which caused illegal immigration to surge and America now has 12 to 20 million more illegal aliens from all over the world. Amnesty begets more illegal immigration which in turn restarts the call for amnesty! While both houses of Congress quibble over their conflicting versions of immigration reform, we private citizens and our state legislators need to tell them that illegal immigration doesn't need reformed, it needs to be stopped! Every time congress "reforms" a broken law they always make it worse. There is an alternative that we the people can pursue. Our Founders gave us the second method in Article V for amending our Constitution when "we shall deem it necessary." Or, as President Obama proudly calls it: ObamaCare. ObamaCare will be just as damaging to America as amnesty for illegal aliens if allowed to be fully implemented throughout 2014. ObamaCare was enacted on March 23, 2010 and the then Speaker of the House of Representatives, Nancy Polosi, admonished the congress to "pass it so we can find out what's in it." Well, we have read it and most of us don't like what we see. Just about everyone who lobbied for it now wants an exemption. The three-year lead up to the October 1, 2013 roll-out on the administration's web site resulted in a myriad of negative impacts to our health care system and our economy. Their web site proved to be a disaster and portends ObamaCare's future unless we citizens and our state legislatures rescind it by way of Article V.
President Obama often repeated the canard since 2009 that "if you like your health care plan and your doctor, you can keep them, period." It is now apparent that has been a misrepresentation at best and at worst a lie. He denies knowing that the opposite is true and when he learned the truth has not yet been revealed. ObamaCare was supposed to add people to the health care rolls; instead over six million health care insurance policies have been canceled and the insurance providers stated in their cancellation letters that ObamaCare is the reason. Tens of millions more will be canceled and ObamaCare will decimate the the private health care insurance system if left to do its damage. Each of these "plans" actually cover more than one person. If an average of three people per plan is estimated, then over 18 million people have already lost their coverage. President Obama arbitrarily extended the sign-up requirement for big business' for one year and for small business' until November 2014; after the mid term elections. These extensions were done without bothering to ask congress for legislation, which is required to change a law. Many other extensions and exemptions have been granted to selected groups. When small and big businesses convert in late 2014 it is estimated that 80 million more plans will be canceled. You do the math. The majority of those who have enrolled since the roll-out have chosen medicaid in the several states instead of private health care plans, which shocked the administration and will accelerate the bankruptcy of the medicaid program. Current Medicare recipients must keep in mind that the ObamaCare law calls for taking $500 million from Medicare per year to pay for the law. The administration's goal is a "single payer" health care system totally controlled by the federal government. The Republican opposition's plan to rescind ObamaCare is to keep their majority in the house and win a majority in the senate in 2014. To be veto-proof they will need to retain their current 234 seats in the house and gain 58 more seats for a total of 292 seats; and retain their current 45 seats in the senate and gain 22 seats. This scenario is not impossible, but it would be miraculous, which is wishful thinking, not a plan. The major problem with this plan is that by November of 2014, even if the above described miracle were to happen, every aspect of our health care system will have been destroyed and federal "single payer" will be the only alternative. America's heath care will then be rationed by government bureaucrats forever more. The combination of stopping illegal immigration and amnesty and rescinding ObamaCare will reset American politics. We can do this, if we citizens and our state legislators work together. Rescinding ObamaCare is included in my proposed amendment and a petition to your state legislature is on page 32. A final proposed amendment is obviously up to our state legislators and the citizens of each state and it will no doubt bring on a spirited debate between our states and our federal government, which is long overdue. This is now the only way to stop illegal immigration, amnesty and ObamaCare and save our beautiful country from a broken federal government that has forgotten who they work for. In his fifth State of the Union address, President Obama declared that 2014 would be a “year of action” and that if Congress wasn’t willing to work with him, he was prepared to act on his own. He must have missed the class at Harvard on Article I Section I. He has already acted on his own to grant "legal status" to at least 2 million illegal aliens and will do the same for 12-20 million more if congress won't. George Washington didn't want to be a king. President Obama is acting like one and congress doesn't have the votes to override his vetos. We the people are the 21ST Century surrogates for our Founders and we disrespect them if we fail to use Article V. If not now, when? If we don't, we and future generations of Americans will regret our failure to act. 2016 will be too late. If we citizens and our state legislators don't start exerting our states' rights, no one else will. George Washington won't be riding in on his white horse to save us. Our future is our responsibility now. Please read my "Case" and decide for yourself. My attached Case was posted on September 11, 2013. In it I predicted the mass illegal immigration we are now experiencing across our border with Mexico. I wrote (Page 29) that in December of 2011 the then Sec. of Homeland Security, Janet Nepolitano, ordered the ICE director to "prepare a plan to address the health care, sheltering, processing, transition and disposition of large numbers of individuals who might arrive in the U.S. as the result of a mass immigration." The Obama Administration knew then that their actions would cause the collapse of our southern border security. President Obama has set the stage for granting legalization (amnesty) for millions of illegal aliens by executive order. He pulled back from granting this lawless amnesty before the November mid-term elections, but he did so by "executive order" after the votes were counted. Twenty-six states sued to stop his lawless act and Federal District Court Judge Andrew A. Hanen blocked President Obama's plan to legalize over four million illegal aliens. The case will probaly go to the Supreme Court; the same court that struck down the illegal immigration enforcement laws passed by several states. We the people and our state legislatures can stop this travisty. Those 26 states have shown their willingness to fight back against the Obama Adnministration lawlessness. All of our state legislators need to hear from we the people. They need to know we support them and that we want them to stop illegal immigration once and for all future generations. Our Founders gave us Article V to override all three branches of our federal government and it's time for us to unite and stand up to them. You be the judge. History will judge all of us if we fail to act.